internet | Can you spell cacophony? 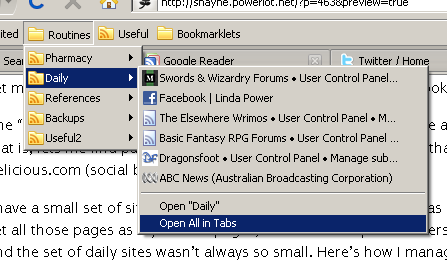 Firefox uses Live Bookmarks, rather than the trimmed-down RSS reader that other browsers like Safari or IE have. It is the number 1 killer feature that keeps me tied to Firefox. When you add a live bookmark to your toolbar or the bookmarks menu, it shows up as a menu, rather than as a single link. In Safari, you are then taken to a page that shows all the “stories” on a single page. 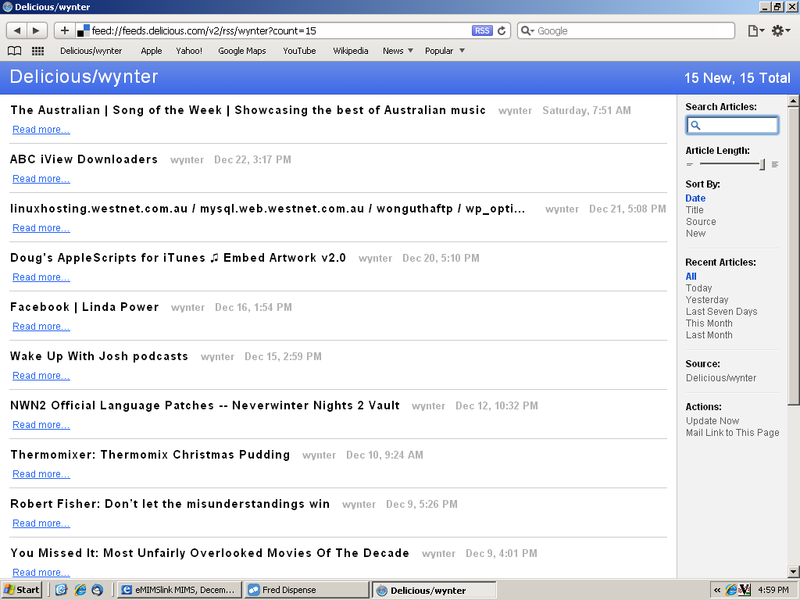 The link on the toolbar is on the left, labelled “delicious/wynter”. If there was a new post in the feed it would show up with a (1) after the name of the bookmark. This is great if you want a newsreader. Click on the bookmark and you get the page displayed as shown in the screenshot. I don’t generally put descriptions in my delicious items, but if I did, you would read them there. So that’s Safari. It does what it does and it does it fairly well. If what you want is a bare-bones RSS reader mixed in with your browser, then you are set. The problem is, I don’t. If I wanted the latest stories from the New York Times (which btw is one of the default bookmarks in Safari) then I’ll put it in Google Reader (or my RSS reader of the hour). Let me show you instead what I do want. This is how I use Live Bookmarks in Firefox. The “Bookmarks” bit gives it away. I want something that gives me access to bookmarks… that is, lets me find pages I have been to before. It is no surprise that I have decided to use delicious.com (social bookmarking) as my example. I have a small set of sites that I like to visit every day (or as often as I think to). I could just set all those pages as my “home” pages, but I use multiple browsers on multiple machines and the set of daily sites wasn’t always so small. Here’s how I manage to do what I want. On delicious, I bookmark the sites and tag them with “daily” and “routine”. 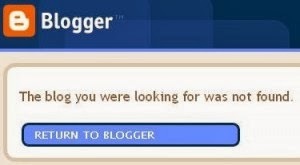 Go to the delicious.com page where all those bookmarks live (http://delicious.com/wynter/routine+daily). In the address bar I see the beautiful orange RSS logo. If I click on that, I get a page not dissimilar to Safari’s with the posts at the bottom and some subscription options at the top. If I chose to subscribe by Live Bookmarks, I get to choose where to put my Live Bookmark. Normally, you would choose the Bookmarks toolbar. I have put this into a sub-folder (namely “routines”). So you can see that if I go to my little “Routines-Daily” menu, I can get at all of my links that I want to. Even better (and this works for any FF bookmarks), I can hit the “Open all in tabs” option to get the whole lot to open in one hit. (And yes, before any smarties comment, I can right-click the menu to do the same thing). So that’s it. Build a list specific tags in delicious, grab the RSS feed and put it in a large bookmark and you’ve got a handy menu that you can adjust and have reflected in any browsers you’ve set up with that menu. As you can see from the screenshot, I’ve got a few set up here. I’ll be explaining the “Useful” feed (next to the Routines folder) in a future post. One last thing:I might have to eat a little portion of humble pie. I hadn’t looked closely, but it seems that IE’s Web Slices does a very similar thing. Of course, there are plenty of other reasons not to use IE so I won’t let it bother me.